UDM Downloads > Turbine Mobile! Turbine Mobile dynamically generates Flash Lite for mobile phones. 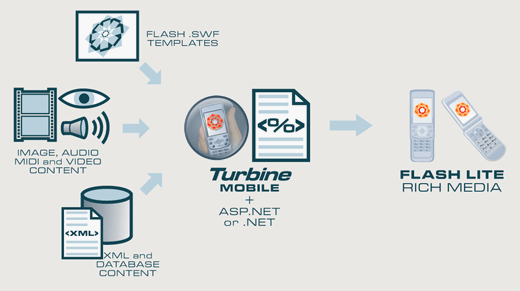 By dynamically integrating image, audio, video and database content into Flash SWF templates, Turbine Mobile generates Flash Lite content from your web site. Features and Benefits: - Generates Dynamic Flash Lite: Generates Flash Lite 1.1 and 1.0 format movies with dynamic content to any mobile device capable of displaying Flash Lite. - Overcomes Flash Lite limitations: By integrating dynamic server-side content into Flash Lite, Turbine Mobile overcomes the natural limitations of static Flash Lite movies. - Image, Audio and Video Integration: Create Flash Lite movies packed with image, audio and video content integrated from several formats, from local or remote locations. Converts video into Flash Lite movies. - Visual Development by Using Flash SWF Templates: Use Flash SWF files as visual templates to simplify and speed-up development. Dynamic elements like images, text and audio can be directly placed in the visual template. - ASP.NET and .NET Integration: Being a .NET component, Turbine Mobile is closely integrated with the ASP.NET environment, allowing content integration from any data source available. Also works from standalone Windows Forms applications. Linux and Windows PHP versions also available. - Ring Tones Audio Integration: Can dynamically embed external ring tone-like audio formats supported by Flash Lite, like SMAF, MFI, MIDI and FLCS (Flash bundle files). Ideal for generating Flash Lite ring tones. - Internationalization and Emoji Support: Generates to devices in different languages by supporting both ANSI and Shift-JIS Flash Lite encodings. Supports i-Mode and EZMode Emoji characters for compatible mobile devices. - Efficient: Includes caching support for generated Flash Lite movies, enhancing overall performance. Generated movies are internally optimized to avoid element duplication, creating smaller Flash Lite file sizes.